Town of Prescott (Single Tier Leeds and Grenville)Record Owner? Log in. The first settler was CoI. Edward Jessup, a landowner from Albany, NY. When hostilities broke out between Britain and the American colonies, Jessup recruited and led a regiment for the British cause, which became known as Jessup's Rangers. Jessup's loyalty was rewarded with a large grant of land, which he surveyed as a townsite and named Prescott after Maj.-Gen. Robert Prescott, governor-in-chief of Canada 1797-1807. Until then the place had been known variously as Augusta, New Oswegatchie, Johnstown, Royal Township # 6, and Fort Wellington. larger boats above and below them to more economically carry cargoes longer distances. Because of the site's importance in the nation's transportation system, Fort Wellington was built in 1812, garrisoned until 1826, and enlarged in 1838. 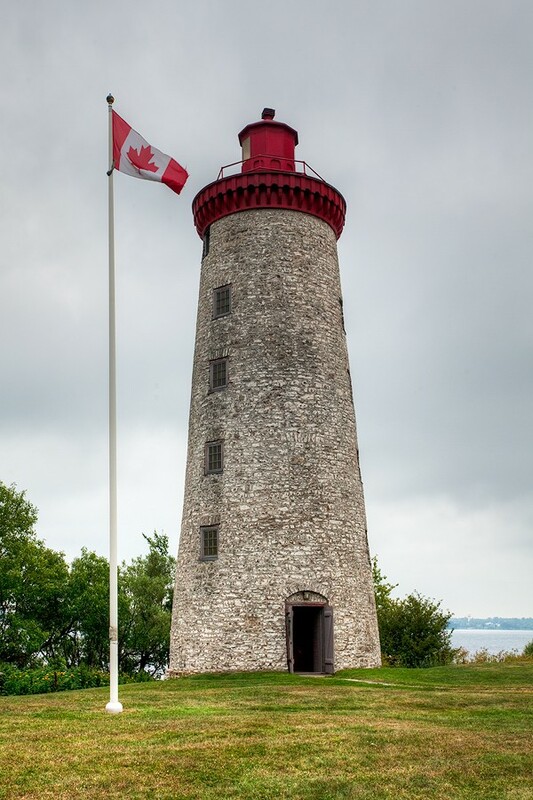 It saw action in the War of 1812, the Rebellion of 1837, and the Fenian Raids, but because it was never attacked and is fully restored, it remains today one ofthe best preserved forts in Canada. In 1838, a misguided Polish expatriate, Nicholas von Schultz, raised a band of 200 Americans and crossed the St. Lawrence R. to free Canada from British rule. The force landed near Prescott and occupied a stone windmill just east of Fort Wellington. They were soon ousted by troops in what came to be known as the Battle of the Windmill. Another historic site, just west of Prescott, is the Little Blue Church, built in 1809 and rebuilt in 1845. Barbara Heck, founder of Methodism in North America, is buried here. Sir Richard W. Scott, author of Canada's Temperance Act of 1878, was born in Prescott in 1825 as was Canada's first military flyer, William F. Sharpe, in 1893. Natural Resources Canada in Leeds and Grenville County. Have something to say about Town of Prescott (Single Tier Leeds and Grenville)?